At Trabasack, we produce a range of functional wheelchair bags with an essential added extra. All Trabasack bags are fitted with an integrated lap tray and as the whole range was invented and designed by a wheelchair user, your needs were considered during every stage of its development. Need a table? Can’t find a desk? Trabasack a handy travel bag with a built in bean bag lap tray. Smartly designed as well as enhanced practicality with its flat tray side. Very handy for drinks! Trabasack bags are streamlined, lightweight, look professional and their universal design means they can be attached to almost ANY wheelchair. We say they fit the person not the chair! Perfect for WiFi living or as a writing aid, the lap tray is firm and secure with the bean bag cushion keeping your legs comfortable and protected. Trabasack products are produced with a durable PVC surface making them ideal for use for food and drinks at home or when out and about. No more worrying about whether you can find a table at the right height in a resturant or cafes! The surface is easy to wipe clean and you can enjoy social eating and drinking without any worries. The Trabasack can be kept attached whilst using it on your lap with a waist strap or use the specially designed “side straps” to attach it onto an armrest or frame. Wherever you go, Trabasack goes! With its very lightweight design, at less than 800g, you won’t be slowed down. You can use the bag space to hold all your personal belongings and the ring pull zips are extra large for easy accessibility and use. It’s even possible to unzip the bag without lifting the Trabasack from your lap. The Curve design is also created to hug your body’s contours making it a comfortable choice in comparison to other lap trays with their sharp edges. The ingenious “Connect” surface option for the Trabasack tray is great for sticking down any items you need to keep in place. Using velcro technology use the soft surface to keep items secure. Whether your phone, TV remote or your DS, iPad or Playstation controller. You can secure whatever you need with purpose designed Trabasack Hook Tape. Trabasack comes complete with two long straps which can be used for many purposes including as a waist strap so you can wear the trabasack securely as a ‘bumbag’ (or in the US a ‘fannypack’). A “quick release” buckle has been added to these straps to ensure easier removal when you want to take it off. Side Straps come as standard with the Curve and Curve Connect models but are additionally available for the Trabasack Mini. They can be used to attach the Trabasack to the front of a wheelchair via its armrest or frame. For optimal use, attach the Trabasack as close as possible to the wheelchair user and if you want to be able to hang it from the back of your chair, simply purchase another set of side straps. Trabasack also makes a great platform for communication aids such as Lightwriters and iPads and is a great mount for gaming equipment too. 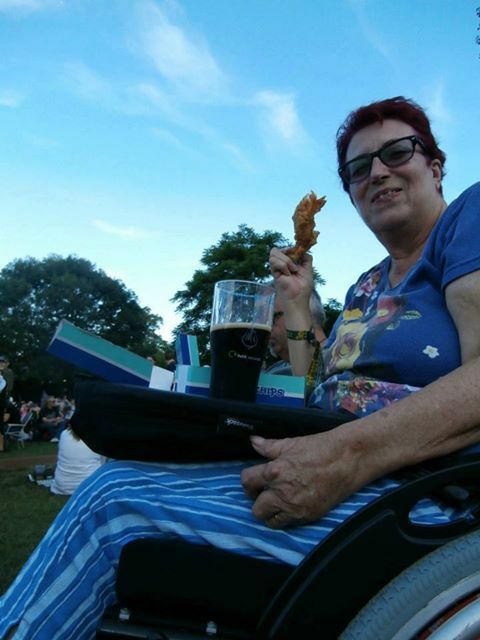 Click on the Our Happy Customers tab to see some of our great reviews and you can visit our Wheelchair Lap Tray’s Blog here. Trabasack is supplied with two Long Straps. These may be used as shoulder, rucksack or waist straps. A ‘quick release’ buckle has been added to the strap to make it easier to get on and off. Side Straps (included with Curve/ Curve Connect trabasacks and also available to purchase separately for Minis), may be used to attach the Trabasack to the front of a wheelchair. This may be part of the armrest or frame. Ideally the Trabasack needs to be positioned as close to the person as is comfortable. An extra pair of side straps may be purchased so that the Trabasack can be easily stowed at the back of a wheelchair when not in use as an alternative to stowing it rucksack style. Click here for more customer comments about attaching a laptop to a wheelchair. Click here for more about using using trabasack as a wheelchair tray or to support communication aids and other devices such as a Toby lightwriter. This is useful to keep things you are transporting on your lap. It is especially useful to carry beverages and food. The Trabasack Curve Lap Tray is easy to just leave on when you are working around the house, and the zippered compartment makes a handy place to carry letters and writing implements. This is a very useful item for those who use a wheelchair for mobility! A. says”I have recently purchased a curved trabasack and I just wanted to let you know that I think this is a fantastic product. M. says ” I bought one at Naidex, and within half-an-hour was using it to support my laptop at the seminar I gave. Why is Trabasack One Of The Best Power Wheelchair accessories around? Wheelchair Lap Trays - the competition!